The driving force behind PrimaLuna is one of high-end audio’s most astute and colorful figures, Herman van den Dungen. It’s been said that many successful, creative people “march to the beat of a different drummer,” but it’s the ability to get others to hear your tune and march with you that distinguishes the most accomplished. Van den Dungen is undoubtedly one of them. With a reputation of gathering the best talent for his projects, the widely-known, Dutch-born entrepreneur in 1998 launched the well-valued AH! Njoe Tjoeb CD player to critical acclaim in Europe. A year later, seeking to expand sales in the United States, he forged a relationship with Kevin Deal. 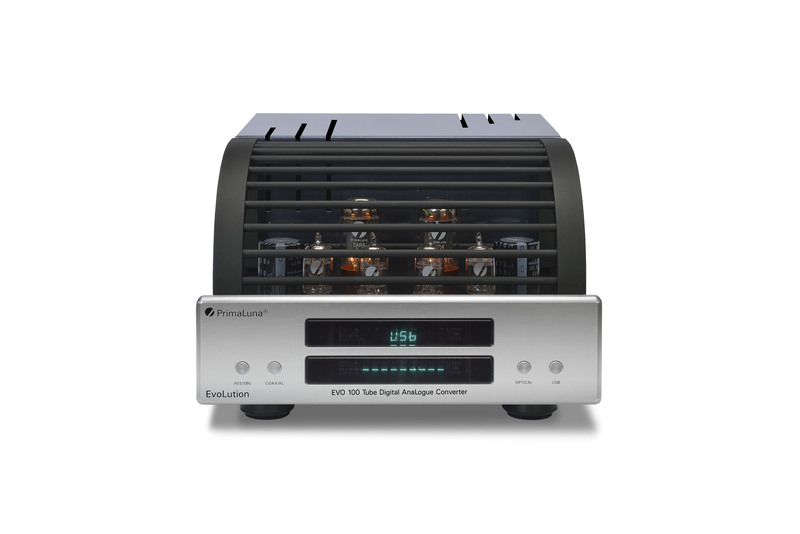 A dynamic, high-end dealer with sufficient capital to import the product, Deal also possessed a characteristic Herman found invaluable—decades of experience in tubes with an intimate knowledge of their ups and downs as they relate to the consumer. The two immediately hit it off, sharing the philosophy of providing an exceptional, reliable product at a great price and delivering incomparable after-sales service. Turning his attentions, Herman had for some time recognized a growing interest in affordable tube components; however, he also noted that existing gear on the market often faced reliability problems and consumers hesitated or refused to buy. In 2000, he set out to rectify the dilemma and assembled a top-flight, world-renown team of European audio designers. For U.S. distribution and sales advice, he once again turned to “tube guru” and friend, Kevin Deal. Initially, Deal declined to take part. As the largest retailer of tube components in the United States, he was acutely familiar with the pitfalls in manufacturing reasonably-priced gear. Further, he understood the U.S. market in terms of sales and what it would take to be successful. These two elements merged into one overriding conviction: the product would have to be extraordinarily reliable. Deal agreed to climb aboard contingent upon the promise of rigorous production oversight and the inclusion of an auto-bias and other self-protection features that would make the components not only dependable but easy to use. Therefore, from the outset, the company’s objective was clear, yet extremely challenging and incredibly complex: create a product with extraordinary sound and sophisticated performance that would bring back to the fold the older, experienced hi-fi enthusiasts who had gone the home theater or solid state route and found it lacking. Further, make that same product relatively inexpensive and easy to use in order to attract those neophytes who had shied away from tubes. Finally, incorporate safeguards to make the product more reliable than any other on the market. To top it all off, make it so beautiful it takes your breath away. SoftStart circuitry that powers the amp up gently and extends tube life. Point-to-point wiring, ceramic tube sockets, Alps potentiometers, Nichicon and Realcap capacitors, WBT style speaker terminals, and gold-plated input jacks. Fully-vented chassis finished with a five-step, automotive-quality, high-gloss, hand-rubbed finish. This incomparable array of standard features can be found on all components within the series—the ProLogue Three preamplifier, the Four and Five power amplifiers and the Six and Seven monoblocs. The release of those components, completed in 2006, was again met with rave reviews and an armful of awards, but does not conclude the ProLogue Series. 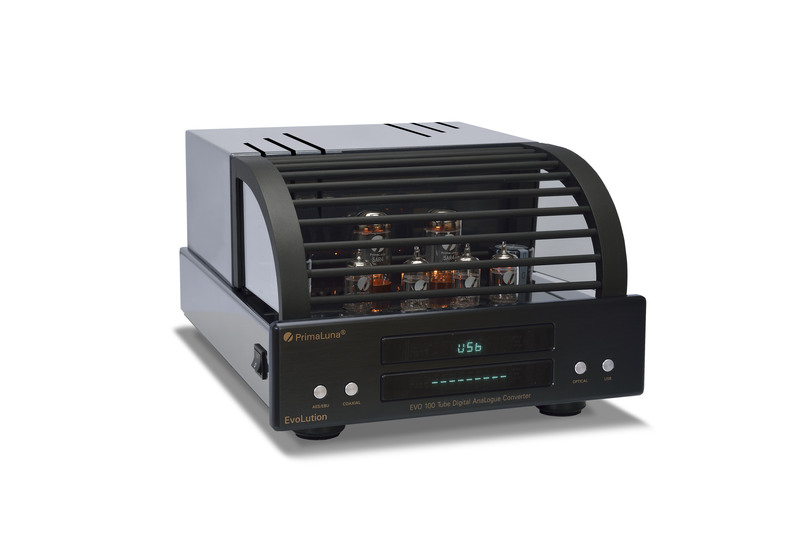 Staying a step or two ahead of the curve, Herman and his team are planning a mid-2007 debut of the ProLogue Eight, an all-tube CD player that will revolutionize the audio industry by introducing the world’s first tube-based data clocking device. However, PrimaLuna’s offerings don’t end with that final component in the ProLogue Series. To the contrary, Herman and the PrimaLuna team introduced in late 2006 the first two pieces in the step-up DiaLogue Series, aimed at audiophiles and home theater aficionados as well. Using ProLogue’s exceptional elements as a base, the brilliantly conceived and impeccably engineered DiaLogue One and Two integrated amps usher PrimaLuna to the next level and raise the bar for affordable high-end audio with astonishing performance and a host of additional features. DiaLogue integrated amps will satisfy the audiophile’s most stringent demands with increased bandwidth and headroom originating from some of the best power and output transformers in the industry. DiaLogue also assimilates into home theater systems so easily anyone can do it—a simple push of a button on the exquisite, full-function remote engages its home theater pass-thru circuitry. What’s more, another button will switch operation from the warmth of triode to the snap of ultralinear. It’s all bundled into a dazzling chassis with PrimaLuna’s standard-setting build quality and unparalleled reliability. Just as they did with ProLogue, PrimaLuna plans a full line of DiaLogue components however no further release dates have been set. As you can by now surmise, the minds behind PrimaLuna possess a sincere desire to bring something unique to hi-fi enthusiasts, from beginners to tried-and-true audiophiles. We want people to feel that when they purchase any PrimaLuna, they’ve bought a truly special product: that when they open the box and take it out, they’re thoroughly surprised by the beauty and build quality and that when they finally play it, they’re completely swept away. Think of that moment when you were a child and opened a present at Christmas to find something far more wonderful than anything you’d imagined. That’s the PrimaLuna experience, one we try to impart with every component we produce. Kevin Deal – He often shudders at the words but many in the audio industry refer to Kevin Deal as the “Tube Guru”. Unquestionably, he ranks as one of the foremost experts in vacuum tubes so it is little wonder that PrimaLuna’s Herman van den Dungen sought his friend’s advice in designing the company’s first components. Deal brings nearly 30 years of experience to the PrimaLuna team and his counsel in design and distribution-has proved invaluable. The track that brought Deal into the world of high fidelity was created by three pivotal events that unfolded before he was ten. Entranced by his neighbor’s oscilloscope, then five-year old Kevin proclaimed he wanted to grow up to be an electronic technician. A few years later, the sounds of Joplin, Hendrix and Zeppelin bewitched him to the degree that he dreamed of nothing but music. Three pivotal events that ultimately married technical expertise, business acumen and passion under the umbrella of high fidelity. Deal studied intensely, digesting not only the internal construction of tubes but their history as well. He scoured shops for the unusual, curious as to how they would sound. During one of his hunts, he came across a massive cache of rare tubes and borrowed against every credit card he had to buy them. Thus Deal launched Upscale Audio in 1994, providing primarily tube upgrades while selling a select group of product lines. With a reputation forged on exceptional customer service and product knowledge, Deal has built Upscale Audio into one of the premier retail establishments in the country. Deal and Herman van den Dungen met in 1999, exploring how they could best bring the AH! CD player, already a huge success in Europe, to the US market. A friendship developed and several years later, Herman sought Kevin’s advice on designing and distributing the PrimaLuna components. Both view business the same way: provide an extraordinary, reliable product at a great price and deliver exceptional after-sales service. Because of unsatisfactory experiences, Deal initially wanted no part of distributing a Chinese manufactured product. Ultimately he relented, contingent upon the promise of rigorous production oversight and the inclusion of an auto bias and other self-protection features, all of which make for unmatched dependability. PrimaLuna went one step further, with its Adaptive AutoBias, a feature never before found on equipment in this category. Deal is now PrimaLuna’s proud North American distributor. Deal maintains his love of tubes and travels several times a year to scour the hinterlands of the world for those rare finds. Herman van den Dungen – If ever there was a “High Fidelity Hall of Fame,” Herman van den Dungen would be a certified member. Hi-Fi News’ Ken Kessler called him “… the closest that audio has come to producing its own Keith Richards,” a testament to both his ability and longevity in the field. His path to such stature was charted when the adolescent van den Dungen began trying to repair radios, turntables and recorders; picked up momentum when the 25-year old opened his high-end import company; raced to prominence with the creation of Kiseki and Milltek cartridges; and is climbing towards the pinnacle with the release of his own components: first, the AH! CD players and now, PrimaLuna. Herman brings more than 30 years of high-end experience to the PrimaLuna project. Throughout his audio career, the Dutch-born distributor and manufacturer has emphasized two key elements: offering an affordable, reliable product that provides the customer with a joyous cost-value surprise and amazing the rare customer in trouble with rapid, effective after-sales service. Graduating from college in 1972, van den Dungen spent three years as a teacher before starting Durob Audio BV, one of the very first high-end import companies in the Benelux. Several years later, he opened four stores where he honed those key, customer-related principles. He also developed a keen ability to sense needs in the market and how best to fill them. In some cases, Herman simply brought an existing product to market. However at other times there was a void, in which case Herman and his team created and/or manufactured the product. Either way, always guiding the process were those key principles: quality, affordability and reliability. It was those earlier experiences that prepared him first for the AH! Njoe Tjoeb CD player and now, PrimaLuna. In the early 2000s, van den Dungen recognized a growing interest in affordable tube equipment, however the existing gear often faced reliability problems and consumers new to hi-fi hesitated to buy. The 56-year old entrepreneur wanted to bring those prospective customers into the fold with a product that would also stimulate the European market. In 2003, he assembled a team to create the PrimaLuna ProLogue line that would fill the need, and in several months they had created a high-quality, dependable product. However, to make it affordable it would have to be manufactured outside of Europe – in China. Herman investigated for months before settling on the right manufacturers. Although they require constant supervision, the results have far exceeded expectations. The ProLogue components have an infinitesimal defect rate of just one half of one percent – unheard of in the industry – which makes it more reliable than solid-state gear. In PrimaLuna, van den Dungen has brought to the market the glory of tubes in a high-quality, affordable, and reliable product. Dominique Chenet – Like so many professionals affiliated with the audio industry, Dominique Chenet entered the field with a love for music, although it came to her in a peripheral way. Her participation in ballet and modern dance exposed her to some of the finest music ever written and once ignited, her interest has burned brightly. The 43-year-old woman plays an integral role for PrimaLuna: she acts as the liaison between the Chinese and Dutch teams. Put a different way, it is Chenet who helps ensure that the Dutch design developments are properly carried out by the Chinese manufacturers. In the past, co-coordinating between East and West has proved problematic and the well-laid plans of many a company have crumbled due to quality control issues. Dominique helps resolve those issues by guaranteeing that the manufacturer strictly adheres to the exacting standards of PrimaLuna’s design-team and that consistency has played a significant part in PrimaLuna’s success. The French-born Chenet first entered the audio industry in 1984, overseeing the export department of Jadis Electronics. After an extended foray as general manager for an international marketing and communications company, she returned to the field with PrimaLuna. Living in The Netherlands, Dominique Chenet brings various talents to PrimaLuna. Degreed with an MBA in International Commerce and Management, she possesses an acute business acumen which blends quite effectively with her understanding of the Chinese business culture and her growing ability to speak Mandarin.